To Love An Irishman is the kind of book you'd read while sipping a nice cold (or warm) pint of lager or ale. Whether you prefer the warm taste of Guinness or the sweet taste of Yuengling. No matter what you choose, you'd be in a most relaxing state after at least two, three, or four! Please feel free to contact me on my website: www.divajefferson.com. 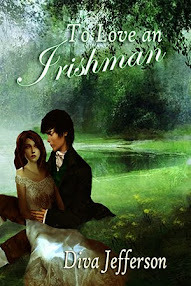 What you can win here: An e book copy of To Love An Irishman! How to enter: Just leave a comment below naming YOUR favorite drink and be sure to include your email address! My favorite drink is a glass of white wine. I love me a Guinness or a Smithwick's! I first tied Smithwick's while I was in Dublin and it quickly became one of my favorite beers. For special occasions I also love a good Glenfiddich or Jameson's! An Irishman and Gaelic speaking...ok...where do we sign up? Love your site and sounds like Aveline is in for an adventure! When I drink, I like a dry red wine preferably an import...but have to say the BC wineries are fine! Good choice! No problem, Judy. Thanks for sharing. Haha. All you have to do is leave your email address for the contest. Yes, he is a great writer and inspiration. Thanks! I love a delicious, hot cup of Irish Breakfast tea! Love the sound of this book! I love a Strawberry Daiquiri. Thanks for being on the hop! My drink of choice varies with my moods. I usually like to drink a Woodchuck Pear Cider on draft. I am also very fortunate that I live very close to Schlafly brewing and they may seasonal Ciders. I love them all. I like Sea Breezes and Moscato wine. Don't worry about it. Although, I will say Lauren, Bailey's is worth having in your coffee!!! Also, a great choice Sherry! You welcome, Mel. MMM Cider is very good indeed. Thanks for sharing! Not entering the giveaway, just cruising around on the hop. I HAD to say hello to a fellow Diva though. My fav cocktail is Ceasar or Bloody Ceasar as it also known. Very similar to Bloody Mary but different with Mott's Clamato instead of tomato juice and iwth the rim and stalk of celery and a few drops of Tabasco sauce. If you find yourself in Canada, order one. I don't drink, but years ago I did drink Amaretto & 7-up once in a while. Sounds bubbly. I will try it one of these days. Thanks for dropping by! Wine. Sangrias made with red wine, strawberries, blueberries, blackberries, and raspberries are divine. I'm really curious to try Pumpkin Wine by Three Lakes Winery. @ What Mel B. said: I've never had Woodchuck Pear, but Woodchuck Amber is delish. It's a hard apple cider. A nice Riesling would do me good! Or a Margarita on the rocks, salt on the rim with a bit of grand marnier is divine. Fruit is definitely good with alcohol. Thanks for sharing! I dont like alcohol. My favorite drink is sweet tea. Yum! :) Thanks for sharing and for the giveaway! I've recently began my weight loss journey and only drink water, some juice at times so I don't usually drink alcohol. However, when I used to eat out at Olive Garden, I loved their Chocolate Almond Amore! !